The Exploratorium is a public learning laboratory in San Francisco exploring the world through science, art, and human perception. Its mission is to create inquiry-based experiences that transform learning worldwide. It was founded by physicist and educator Frank Oppenheimer and opened in 1969 at the Palace of Fine Arts, its home until January 2, 2013. On April 17, 2013, the Exploratorium reopened at Piers 15 and 17 on San Francisco’s Embarcadero. The historic interior and exterior of Pier 15 was renovated extensively prior to the move, and is divided into several galleries mainly separated by content, including the physics of seeing and listening (Light and Sound), Human Behavior, Living Systems, Tinkering (including electricity and magnetism), the Outdoor Gallery, and the Bay Observatory Gallery, which focuses on local environment, weather, and landscape. Since the museum’s founding, over 1,000 participatory exhibits have been created, approximately 600 of which are on the floor at any given time. The exhibit-building workshop space is contained. 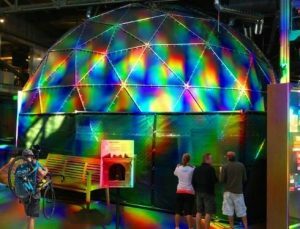 The Exploratorium offers visitors a variety of ways—including exhibits, webcasts, websites and events—to explore and understand the world around them. Step inside a tornado, turn upside down in a curved mirror, walk on a fog bridge, and explore more than 650 hands-on exhibits. You’ll find all of this plus unique programs, discussions, and events; a cafe and restaurant; two stores (one with an Art-O-Mat machine); and more at our beautiful bayside location. Saturday–Thursday (All Ages) 10:00 a.m.–5:00 p.m.
Thursday Evening (Ages 18+) 6:00–10:00 p.m.
Friday (All Ages) 10:00 a.m.–9:00 p.m. The Bathhouse building was built in 1939 as a joint project of the City of San Francisco and the New Deal Works Progress Administration (WPA), and is the focal point of the Aquatic Park Historic Landmark District. This unique structure was designed in the Streamline Modern style, a late offshoot of the Art Deco period, and mimics the clean lines of an ocean liner. The building is a showcase for art created during the 1930s by Sargent Johnson and Hilaire Haler. Dazzling murals cover the interior walls. After occupation by troops in WWII from 1941 through 1948, the building became home to the San Francisco Maritime Museum and the country’s first Senior Center. The museum was operated by the San Francisco Maritime Association until it was transferred to the National Park Service in 1978. The Maritime Museum is open daily from 10:00am to 4:00pm. The WPA-era murals in the lobby have been restored. Please stop by to enjoy the vibrant colors depicting a dreamy and strange underwater world. Fees & Passes: Visit the Hyde Street Pier ticket booth to purchase a ticket to explore the historic vessels. Cash and credit/debit cards with Visa/Mastercard logo are accepted. Credit/Debit cards preferred for payment. Entrance to the ships is free for supervised children 15 years of age and younger. Types of Entrance Fees: $10 Individual Entry Pass – valid 1 through 7 days per person fee for visitors to the historic ships. Non-transferable. Valid for San Francisco Maritime National Historical Park. San Francisco Maritime National Historical Park Annual Pass – $50 Valid for San Francisco Maritime National historical park one year from month of purchase. The pass is non-transferable. For more information, please call the Visitor Center, 415-447-5000. Chinatown was the port of entry for early Hoisanese and Zhongshanese Chinese immigrants from the Guangdong province of Southern China who traveled across the Pacific Ocean during the Gold Rush. In addition to being the largest Chinatown outside of Asia, it was the first one in North America, and its colorful stores, temples, restaurants, and tea houses draw curious visitors from all over the world who want to explore this unique neighborhood. Located between Union Square and North Beach, it is an entirely different world full of surprises! San Francisco’s Fisherman’s Wharf area is the city’s most popular tourist destination where millions of domestic and international tourists come to visit its popular attractions, museums, aquarium, and especially to see the famous sea lions. The wharf is home to a variety of restaurants, bars, and shops as well as an eclectic mix of street entertainers. Other popular attractions include the Musée Mécanique (featured in the movie, ‘The Princess Diaries’), the Wax Museum and Ripley’s Believe-It-Or-Not. This is also the location for bay cruises, and we are happy to arrange a San Francisco and Bay Cruise combo tour if you wish to explore San Francisco Bay after your city tour. Nob Hill is well known for its elegant ‘Big Four’ hotels: the Fairmont, the Huntington, the Mark Hopkins, and the Ritz Carlton. Travel guides recommend ridding the cable car on California street that runs through Nob Hill District. Checkout the historic Fairmont hotel and picture Tony Bennett new statue while listening to his famous song” I left my heart in San Francisco”, You may also consider dinning at the exotic Tonga room or at top of the Mark restaurant that offers spectacular views of San Francisco Bay. Don’t forget to visit Grace Cathedral, with its magnificent central spire and towers, is the focal point of Nob Hill, and attracts a large local congregation as well as many visitors, including architecture lovers from around the world who come to admire this historic monument. The original Grace Church was founded in 1849 but was damaged in the 1906 earthquake. The Neo-Gothic Style Cathedral we see today was completed in 1964 after 36 years of construction. Grace Cathedral is famous for its 44-bell carillon and labyrinth, modeled after the medieval labyrinth in The Cathedral of Our Lady of Chartres in France (there are two labyrinths at Grace Cathedral, one indoors, one outdoors). Huntington Park: Located on Nob Hill and surrounded by the Grace Cathedral, the Fairmont Hotel, and the Mark Hopkins Hotel, Huntington Park is a quiet place that features a playground for kids, plenty of benches to kick back on, and a nice area for your dogs. There are restrooms available, too. Union Square is a beautiful and historic plaza, which was once used for rallies to support the Union Army during the Civil War. The plaza is bordered by some of San Francisco’s most notable stores including Macy’s, Saks Fifth Avenue, Tiffany & Co., Levi’s that has been replace by Apple store recently, Nike, Neiman Marcus, Cartier, North Face, Louis Vuitton, and Victoria’s Secret, with plenty of more shopping choices and upscale boutiques, trinket shops, and The Westfield Mall just a couple of blocks away. Many of San Francisco’s busiest theaters, restaurants, and old style saloons are located on or close to Union Square. Two cable car routes serve the Union Square area where top hotels are located like the Westin San Francis, San Francisco Drake, Marriott, Grand Hyatt, Hilton, Park 55, Nikko among other hotels in the area. The Financial District is home to the city’s largest concentration of corporate headquarters, law firms, insurance companies, real estate firms, banks, and other financial institutions. The Montgomery Street block, described as ‘the Wall Street of San Francisco,’ is dominated by The Pyramid, San Francisco’s tallest building, which was built in 1972. During the Gold Rush, a large area around Montgomery Street became known as The Barbary Coast, a red-light district with a reputation for gambling, prostitution, looting, and vigilante groups. The 1906 earthquake destroyed much of the original Barbary Coast, and reconstruction efforts transformed it into a classy entertainment district. Jackson Square, a small area known for its high-end art galleries and design firms, has recently become known as Silicon Alley, as venture capitalists living in San Francisco opt to have offices here rather than Silicon Valley. North Beach, otherwise known as ‘Little Italy,’ is a popular destination for locals and visitors thanks to its lively nightlife, jazz and blues music, character-filled bars, bohemian coffee houses (no Starbucks! ), restaurants and specialist shops, many of them over 100 years old. The neighborhood adjoins the Financial District and Chinatown (on one block you’ll have the best view of The Pyramid, San Francisco’s tallest building). North Beach is also famous for its churches, such as St. Peter and Paul on Washington Square as well as the church and national shrine of St. Francis of Assisi, patron saint of San Francisco. Telegraph Hill, and Pioneer Park, offers superb views of the San Francisco Bay. Coit Tower, atop Telegraph Hill, was built in 1933 in honor of the eccentric Lillie Hitchcock Coit who, as a teenager, was rescued from a fire. The Tower’s architectural design is Art Deco, but is locally perceived as reminiscent of a fire hose nozzle. The inside of the Tower is famous for its historic murals, with scenes depicting California from the Gold Rush to The Great Depression. Nearby, you will find the Filbert Street Steps, one of San Francisco’s famous stairway walks. 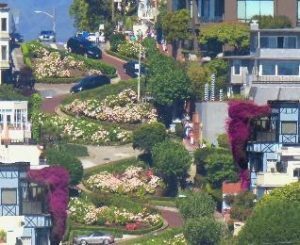 One block of Lombard Street on Russian Hill is famous for its steep hill and eight tight hairpin turns. With a 27% gradient, which was too steep for most vehicles, the street was paved with bricks and switchbacks were built in 1922. Until 1939, it was a two-way street. Photos of the street with its beautiful hydrangeas, which appeared on a postcard, began to draw tourists to the area in the early 1960s, thus began the custom for visitors to drive down what became known as the ‘crookedest street in the world’. Access to the street is prohibited for large vans and tour buses, but is accessible smaller vehicles. For that reason, all tour guides highly recommend booking a private SUV tour to explore hidden sights and narrow streets like Lombard, Vermont etc. In addition to admiring the beautifully maintained hydrangea gardens, the drive down Lombard Street offers one of the most amazing views across North Beach to the Bay Bridge. The Palace of Fine Arts is a stunning masterpiece inspired by Roman and Greek classic architecture. It was designed by Bernard Maybeck (a prominent architect in the Arts and Crafts Movement of the early 20th century), and constructed in 1915 for the Panama-Pacific Exposition. The dramatic and impressive setting of the Palace of Fine Arts prompted filmmakers to feature this unique structure in many movies including ‘The Rock,’ ‘Vertigo,’ and ‘The Bachelor.’ While you’re enjoying a stroll by the lagoon, you may see couples exchanging marriage vows or posing for photos, as this is one of the most beautiful locations in San Francisco for weddings and nature lovers. Pacific Heights is one of the most affluent neighborhoods in San Francisco and, from many vantage points, offers panoramic views of the Golden Gate Bridge, San Francisco Bay, the Palace of Fine Arts, Alcatraz, and the Presidio. Part of this elegant neighborhood was first developed in the 1870s, with the building of small Victorian homes and, after the 1906 earthquake; many were replaced with larger period homes in a variety of architectural styles such as Mission Revival, Edwardian, and French Château. Some of San Francisco’s wealthiest business tycoons, actors, politicians and celebrities live in the gorgeous mansions that grace Pacific Avenue and Broadway in particular. The area is also home to many international consulates. As of 2013, Pacific Heights was named the most expensive residential neighborhood in the United States, with some mansions going for around $35 million! These scenic hills and gorgeous views made Pacific Heights the perfect setting for famous movies, including ‘Mrs. Doubtfire’. Some of Sea Cliff’s more famous current and past residents include Jefferson Airplane guitarist, Paul Kantner, actor Robin Williams, actress Sharon Stone, actor Cheech Marin, Gap founder Donald Fisher, and Metallica guitarist Kirk Hammett. Many of the homes in this Mediterranean style neighborhood enjoy panoramic views of the Pacific Ocean, the Golden Gate Bridge, China Beach and Baker Beach (a short walk on the beach is optional). Tour buses and vans are prohibited in this area to maintain privacy and exclusivity, but our SUVs are permitted! The California Palace of the Legion of Honor Art Museum (abbreviated to Legion of Honor) is one of San Francisco’s fine arts museums, and is perched atop the cliffs at Land’s End. It is a replica of the French Pavilion built for the 1915 Panama-Pacific Expo, and was completed in 1924 as a memorial to the Californian soldiers who died in WWI. The museum contains a representative collection of European art and sculpture, the largest portion of which is French, including one of Rodin’s ‘The Thinker’ and Joan of Arc. Land’s End, on which the Legion of Honor is built, is part of the Golden Gate National Recreation Area located on San Francisco’s wildest and rockiest coastline. It was once strewn with shipwrecks from years gone by and rife with landslides. The area is home to the best hiking and scenic trails in the city that run along hanging cliffs and stupendous of Views of San Francisco Golden Gate Bridge and landmarks. 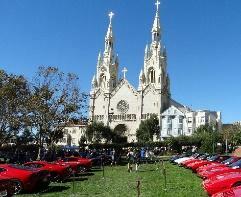 If you missed the part 1 of San Francisco Top Attractions, click here. 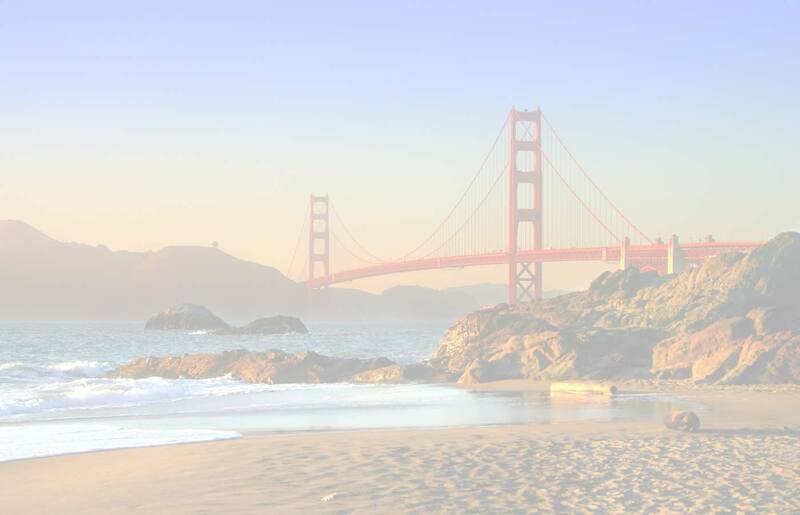 There’s lot more attractions to see in San Francisco, check them out in part 3.